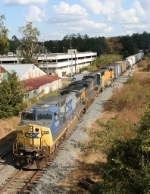 Description: CSXT 7685 & 8499 are seen on a EB leaving Cumberland, MD. Description: CSXT 7685 is seen on a EB leaving Cumberland, MD. Description: After spending two hours at West Springfield Yard with marker trouble, Q437 heads west over Elm St. and knocks the signal down at CP-107. 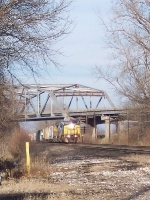 Description: This CSX grain train continues its southward trek after meeting a northbound empty coal train at Guthrie.